Los Angeles, Ca. – Shadows cut long and lean through the greenscape of Griffith Park this morning as runners toured the 2.7 mile golf course loop at the Ranger’s station, one of L.A.’s most popular running routes. 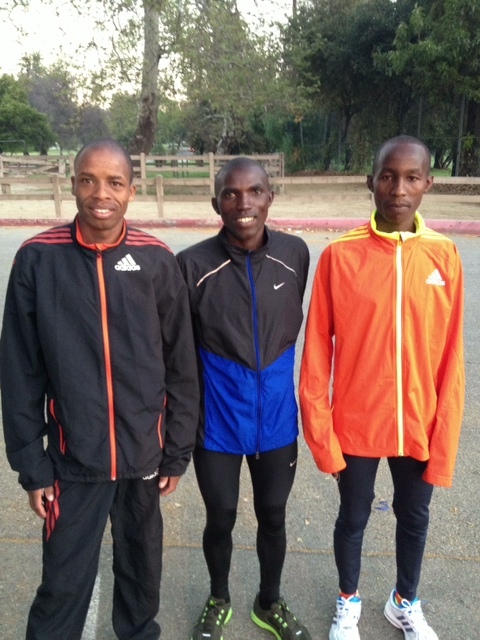 But among the string of regulars hitting the hard-packed dirt trails came a head-turning group of three exotics from faraway Kenya in town for this Sunday’s 28th ASICS L.A. Marathon. Defending L.A. champion Simon Njoroge (in blue), 2:07-man Nicholas Chelimo (in orange), and 2011 Nairobi Marathon champion Ernest Kebenei (left) had arrived last night from the long haul out of Kenya, and were looking for an easy travel rust remover. And though their speed was well in check on the casual six-mile jog, there was no disguising their world-class forms and rhythms. “Who are those guys,” asked Craig Henry, the coach and member of the Los Angeles Police Department team who were in the park training for the April 13-14 Baker to Vegas Relay, a 120-mile slog from Baker, California to Las Vegas, Nevada through perilous Death Valley. 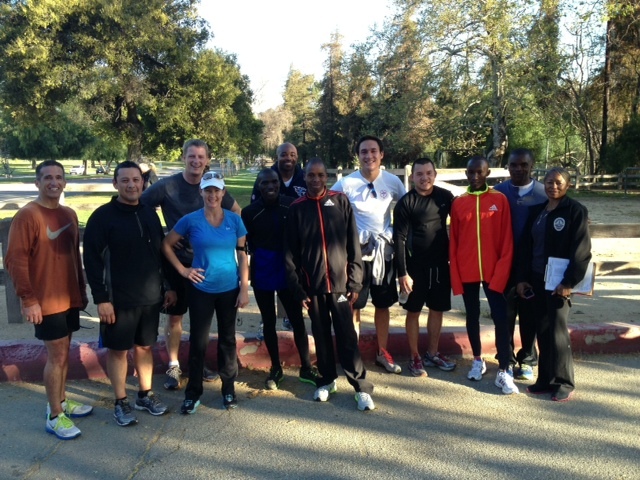 While the three Kenyans shook the dirt from their shoes and leaned into the stretching routine, I introduced the LAPD team who huddled around for pictures as I learned more about the unique Baker to Vegas Relay from Coach Henry. The Baker to Vegas Relay is now in its 29th year, and Coach Henry, himself, has been competing since 1988. Beginning in 1985 with 19 teams, the competition is today limited to 270 teams. It is the largest law enforcement event of its kind in the world with teams participating from Calgary Canada, Royal Canadian Mounted Police, both men and women, Berlin and Hamburg Germany, and law enforcement teams throughout the United States. Over 8000 runners participate in what is billed as the largest foot pursuit in the world. Coach Henry seemed a no-nonsense leader. He competed in cross country and track at Carson High School, and later, at Long Beach City College and CSU Long Beach. He carries personal bests of 1:49, 4:17, and 9:28 from 800m to two miles. Two years ago at age of 51, he ran the 800 meters at the 2011 World Masters Track and Field Championships in Sacramento. He has also coached the SRLA (Students Run L.A.) Marathon team, arguably the most praise worthy marathon program in the country. As the LAPD group went off to cool down, a pack of youngsters whipped by finishing their training loops. Before loading into their van, they too checked out the rapier-thin men in the colorful warm-ups stretching by the split-rail fence.This was the track team from Trade Tech College in downtown L .A., which focuses on vocational and technical training for career-oriented students. These runners anxiously asked their coach if they could go over and say hello and take pictures. 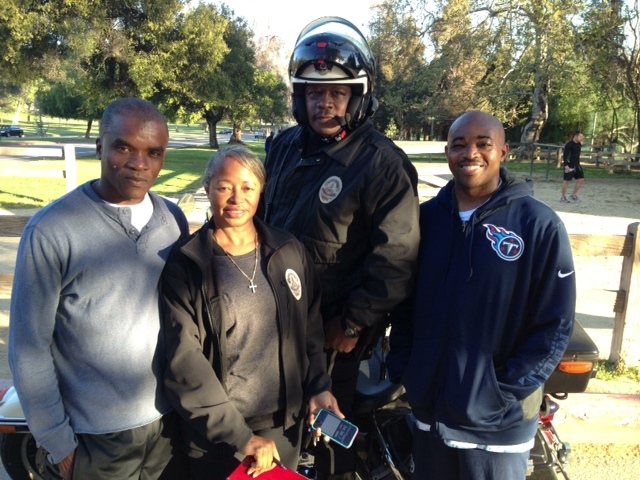 As good-byes and good lucks were exchanged, it became evident that whenever anyone tells you that people don’t know or care about Kenyan runners coming to town to compete, try asking the LAPD Relay team or the kids from Trade Tech. You may hear a different conclusion. 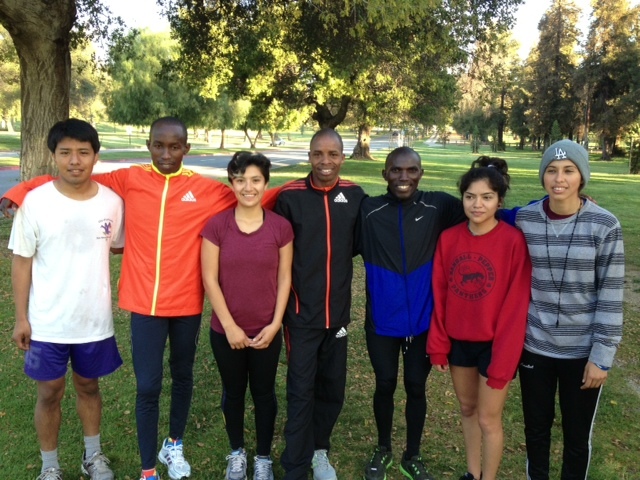 And if you are around Griffith Park tomorrow morning around 6:45 a.m., there will be an even bigger pack of L.A. Marathon contenders on hand for an even quicker session. Bring your cameras.